I was in Delhi, and had spent almost three months there. 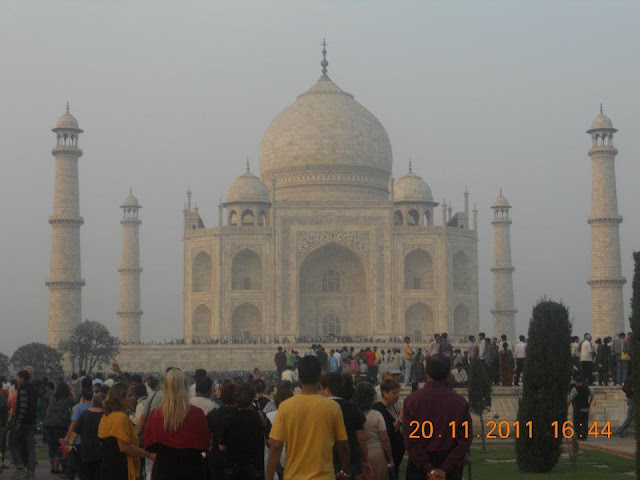 One fine day I decided to tour Agra. Though nobody turned up to join me, I traveled alone. Interestingly, I had a good company on board the tourist bus. Robin, a Management consultant from Netherlands turned out to be a really good person. We spoke at length from Science to Economics, and about a variety of things. And I could not feel the void of anyone. Travelling alone is at times a really joyous feeling. However, after that day I didn't hear anything from him. I contacted him on FaceBook but still I didn't get any reply. Taj Mahal from a few meters far away looks heavenly. However, once you are in, you'll lose your interest. The inside of Taj Mahal is not lit. And these days you have to be in a queue and the queue is rushed inside out - given that they close entry by sunset. I remember my friends who visited Taj Mahal say that they would sit there for hours, and that it was a common place to idle your time. The atmosphere there any time you go is appealing to senses. If you're in India, and you have not seen the Taj Mahal, you have seen nothing. Travelling alone adds all kinds of possibilities to a trip. That can be exciting or tranquil as the fit strikes. The Taj Mahal did not impress me much. Agra was a dirty cess pool. If you want to experience a place steeped in history and feel emotion, spend a long while at Humayun's tomb in Delhi with a really, really good historian and guide. The physicality of the building is straight forward, but the emotions, it's reason for being and events surrounding it remind me that history is a living thing and contemporary in all ways. Thank you for your comment. I have spent one whole day at Humayun's tomb. Give me some time, I'll post a slideshow of my time at Humayun's time. And I second you when you say that History is a living thing. I am getting nostalgic. I still remember clearly about the day I spent at the tomb.